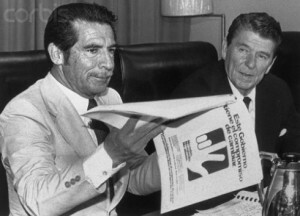 Ríos Montt in the early 1980s with US President Ronald Reagan. A court in Guatemala has found former military leader Efrain Rios Montt guilty of genocide and crimes against humanity. A three-judge tribunal sentenced the 86-year-old to 80 years in prison. Rios Montt was convicted of ordering the deaths of 1,771 people of the Ixil Maya ethnic group during his time in office in 1982 and 1983. … It is the first time a former head of state had been found guilty of genocide by a court in his or her own country. 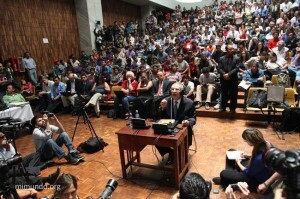 … Relatives and indigenous leaders cheered when the sentence was read out by Judge Jazmin Barrios in Guatemala City. … An estimated 200,000 people were killed in Guatemala’s 1960-1996 civil war, the vast majority of them indigenous Mayans. 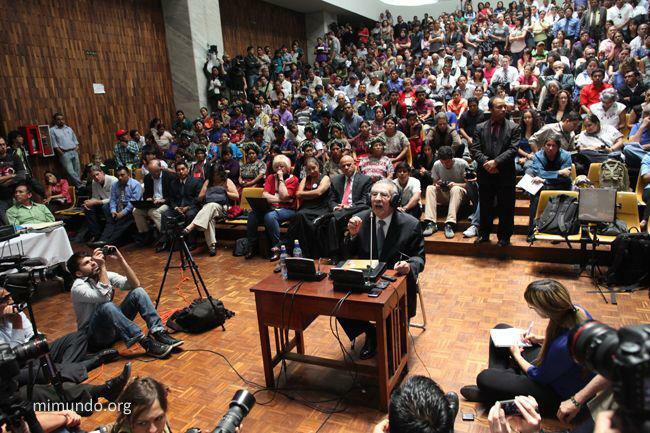 A dictator in the dock: Ríos Montt on trial. More news here; see also Skylight Pictures’ Facebook page.